Acer announce the Liquid E2: Continue their mid-range Android efforts! Acer always seem to hit a sweet spot in the mid-range Android phone market. Their devices offer what people want, relatively cheaply, but the reality is that they don't have the same lure as the top of the market devices from Samsung, HTC, Motorola and the like. That means that Acer never shift tens of millions of these phones, but they're always relatively swift with updates and in our experience their phones are always well built. 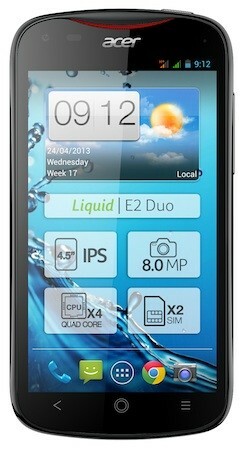 The Liquid E2, pictured above, shouldn't be any different and in fact this seems like a very nice little phone! On board there's a 1.2GHz quad-core processor, a solid 4.5-inch qHD that's 960 x 540p IPS display, an 8 megapixel camera with "zero shutter delay". This phone benefits from two rear-speakers just like its predecessor and it's all running on stock Android Jelly Bean, although we're not sure which version just yet. You can pick one of these up in the UK, France, Germany and a few other countries around and about Europe at some point in the first half of May for €229 with your choice of single or dual-SIM slots! Bioggio (Switzerland), April 24, 2013– Following the success of the Liquid E1 and Z2, Acer today unveiled the Liquid E2 smartphone. This is the latest addition to the lineup and the third smartphone Acer launched since the beginning of the year, further strengthening the company commitment to the smartphone market. Targeted at multimedia user, the Liquid E2 is the first Acer quad-core phone with optional dual SIM card slot giving users all the convenience of having two mobiles in one and easily manage personal and business communications. High-performance quad-core processor combined with an HSPA+ (up to 42 Mbps) data connection lets favorite apps react quickly and flow smoothly, while web pages and streaming media load very quickly. Everything responds instantly. The Liquid E2 is equipped with a zero shutter delay 8MP camera, so every moment can be instantly caught when the capture button is pressed. With speedy continuous shooting, users can take up to 8 pictures per second just by holding down the camera softkey. While the camera lets users capture everything around them, the large 4.5" qHD display based on IPS technology with wide viewing angle allows enjoying photos or videos with friends or family.The camera is also capable of recording crisp 1080p videos at 30 fps so that any event will be memorable. Liquid E2 also features an impressive dual-speaker system and DTS Sound™ for enhanced audio with volume maximization, so users can enjoy their favorite music at its best. The integrated Moodagent creates music playlists based on an individual's mood or uses songs from the library to create playlists that not only matches a person's mood, but also a specific taste in music. The Acer Liquid E2 will be available in Belgium, Netherlands, Ukraine, France, followed by Spain, UK, Italy, Germany and Russia starting from mid-May at a suggested price of €229. The Acer Liquid E2 will be available in two colours: Rock Black and Classic White.